For the second time under head coach Steve Wojciechowski, the Marquette Golden Eagles are going to the big dance. The Golden Eagles were given a five seed in the West region. They’ll play the 12-seeded Murray State Racers on Thursday in Hartford, Conn.
Murray State, winners of the Ohio Valley Conference, is led by point guard Ja Morant, who is averaging 24.6 points, 10 assists and 5.5 rebounds per game and is projected to be a top-three pick in the NBA draft this summer. A matchup with either fourth-seeded Florida State or No. 13 Vermont awaits in the next round for the winner. Big East conference rival Villanova was given a six seed in the tourney. It’s been a successful season for Marquette, as it enters the tournament with 24 wins on its resume, the most in the Wojciechowski era. The Golden Eagles were ranked in the AP Top 25 poll for most of the season, peaking at No. 12 in February. 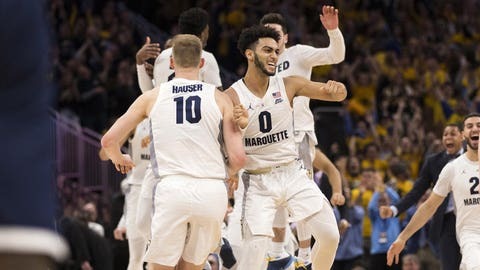 However, Marquette closed its regular season on a four-game losing streak. The Golden Eagles won one game in the Big East tournament but lost 81-79 to Seton Hall in the semifinals Friday night. Marquette fell in its first NCAA tournament test under Wojciechowksi back in 2017, a 93-73 loss to South Carolina in the opening round.